Abanaki Corporation' Vapor-Tight, Explosion Proof Groundwater Remediation System is designed to keep explosive vapors from being vented into the atmosphere. The oil skimming system consists of Abanaki's PetroXtractor belt oil skimmer equipped with explosion-proof electrical components, vapor-tight belt housing and a self-sealing, well-casing mounting clamp. Optimum removal rates are achieved using the patent-pending LFO Fuzzy2 belt made from a special oil-attracting material whose tiny hairs increase surface area and collect light hydrocarbons efficiently. 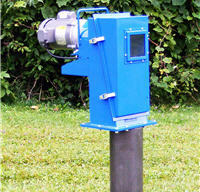 Typical applications are remediating oil contamination from groundwater using existing monitoring or remediation wells. The oil skimmer wiper blades scrape oil from the belt and discharge it into an Oil Concentrator, a small gravity separator that removes any trace water from the skimmed oil. The waste oil flows out of the Concentrator into a transfer tank where a pump activated by float switches sends the oil to a customer-provided waste oil vessel.